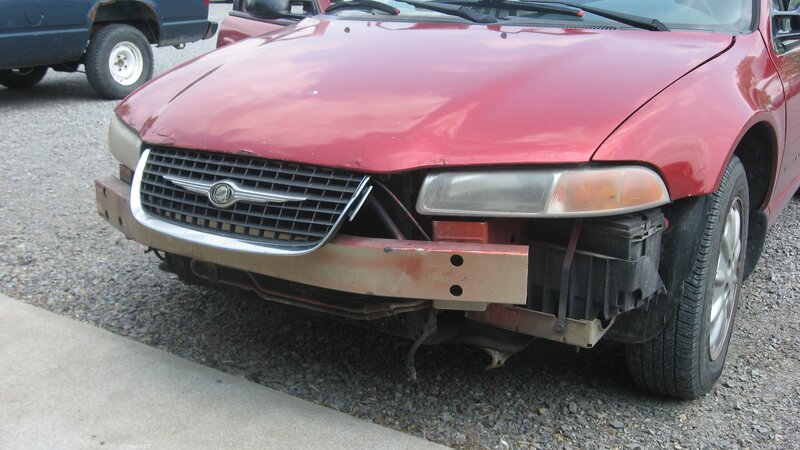 When Should You Have a Bumper Replaced? What Happens During Bumper Replacement? The majority of vehicles are manufactured with a bumper, for both practical and cosmetic purposes. Bumpers very often unfortunately, get damaged during the process of protecting the rest of the vehicle. in many cases they can be patched up and repaired, but in cases of severe damage it’s likely the bumper will have to be fully replaced. Typically, a bumper replacement costs between $885 – $1389, with costs varying based on the cost of the part and the amount of labor time involved in the repair. Front bumper replacement costs will be different from the cost of replacing the rear bumper, and different manufacturers will charge differing amounts for the parts. We’ve collected some example costs of having a bumper repaired from some of the leading auto repair companies. Due to the nature of this repair, costs can vary substantially based on the extent of the damage. A car’s bumper, usually made from aluminium, steel, plastic, or rubber, is a protective shield mounted at both the front and back end of the car. It acts as a shock absorber in the event of a low-speed collision, and also helps to reduce damage to the vehicle. Some bumpers are made with foam material that acts as a cushion, while others have brackets or energy absorbers for the same purpose. As mentioned above, cars are manufactured with bumpers not only to make them look good, but also to protect the rest of the car from being damaged in the event of a low-speed accident. Scratches, dings and dents do occur with everyday use, and corrosion and rust also happen sometimes, all of which not only make your car look unappealing, but lead to your bumper becoming weaker as well. Bumper replacement will also maintain the smooth, aerodynamic look of your car, which will make it fetch a higher price, should you want to sell it at some point. It will also ensure it’s in the best possible condition to protect you and your car in the event of a collision. Just like most other things, car bumpers also suffer wear and tear, not only from being involved in accidents, but also through everyday driving, which causes dents, cracks, and dings to appear over time. Rust and corrosion are a problem which not only lowers the overall appearance of your vehicle, but will also cause your bumpers to weaken. Examine your bumpers, and if you notice the presence of any of the above faults, then it’s time to consider replacing them. This will not only give you peace of mind as to the extra safety of your vehicle, but it will make your car look good again too. Bumper designs have changed over the years, with new bumpers being a lot easier to replace than their old-style cousins, not only because of reduced weight of bumpers these days, but also because of the way they are attached to the vehicle. Determine the extent of damage – a lot of frustration will be avoided if you find out for certain whether it is just the skin that needs replacing, or the entire bumper. Using a flashlight, lie under the front of your car, and examine what needs to be done. Jack the car up if it is too close to the ground. Make a note of all the damaged parts, check to see if only the skin is damaged or the entire bumper structure – for example, whether it is bent back at all. See if any other components are damaged, and if you’re unsure, compare the part to the same part on the other side of the car. Replacing the bumper skin – depending on the car itself, the skin can be only on the bumper, or might go higher up to the top of the grille, which is set into the bumper. A series of fasteners around the perimeter of the skin hold it in place. Standard Phillips-head screws can be removed with a screwdriver, and the pop-in fasteners can be pried off with a small flat blade screwdriver. Locate all these fasteners and remove them with the appropriate tool, and then remove the skin by prying it off each of the wheel wells, which will allow it to move forwards freely. After freeing the bumper off both wheels, it should lift off quite easily. Paint the skin if necessary – it is much easier to paint the skin while it is off the car, so do this before replacing it. Although it is possible to paint it yourself with touch-up spray can paint, it is highly unlikely that you will get a perfect color match, so it is best to get an auto body shop to do this for you. It is a lot easier to examine the bumper structure as well as the foam with the skin removed – they will need to be replaced too, if damaged. Four bolts hold the bumper to the car, and you will need to lie on your back under the vehicle in order to locate them on the rear of the bumper structure. Remove them with a ratchet and correct size socket. Spraying them with a light lubricating oil will make it easier to remove them. Working in the exact opposite direction to how you removed the old bumper, install the new bumper. Avoid tightening any of the bolts until they are all in place, since just a small displacement of the bumper will make it just about impossible to insert any further bolts. Install the new bumper skin – remove any lights from the old skin, and replace them in the new one. The new bumper skin will be installed over the bumper structure in exactly the same position as the old one. Once you have set the skin in place, pull the ends over the wheel wells, making sure that the bumper is in proper alignment with the rest of the car’s body panels. Shift the skin around to get all the fasteners started, tightening them only once all the fasteners have been started. Pushing the plunger on any pop-in fasteners will tighten them. Once the skin has been fully installed, reconnect lights that were disconnected. It is very important that safety is taken into consideration when replacing bumpers on your car. Jack stands should be used to support the car, instead of a jack, which is only meant to lift the vehicle. Any movement and the car will topple off the jack. Use the jack to lift the car, then place jack stands at strategic places to make sure that the car is firmly in place before lying underneath it to work on your bumper. You should also wear safety goggles to prevent dirt and debris from falling into your eyes while you are working under the car. Car bumper repair cost can be very expensive, especially if you have the job done by professionals. By doing the job yourself, you will save a lot of money in labor charges, and only pay for the parts you need to complete the job. You can save even more money, if you order the parts you need online, from one of the many aftermarket parts suppliers that are found on the Internet. We’ve compiled some costs for having the bumper replaced on a range of popular car models to help give you an idea of what you’ll pay for your car. There can be huge differences in the labor costs involved, particulalry if the damage to the area is severe.